Another affordable Android slate for 2013? 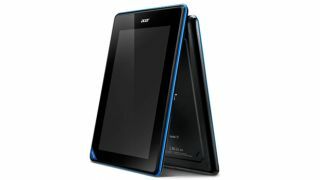 A new Android tablet price war looks set to commence in the new year, following the leak of a new budget offering from Acer. The unannounced 7-inch Acer Iconia B1 tablet, which is said to run Android Jelly Bean, will make a Christmas visit to the Federal Communications Commission this week. The leaked document tells of a Mediatek dual-core processor, with 512MB of RAM and 8GB of storage, so it won't compete at the top end of the Android tablet market, like the quad-core Google Nexus 7. The Iconia B1 bears a striking resemblance to the original Barnes & Noble Nook tablet, mainly due to the coloured home button at the bottom left corner, which is similar to the signature "Loop" button on the Nook slate. It's thought that the Iconica B1 may be launched at the Consumer Electronics Show in Las Vegas next month or, failing that, at Mobile World Congress in Barcelona in February. Any launch is likely to be at the forefront of a renewed drive from manufacturers to further lower the entry level for affordable-yet-capable Android tablets. 2013 is likely to see some big name tablets drop beneath the $100 threshold, following the launch of the original Amazon Kindle Fire and Google Nexus 7 devices that brought prices below £200.